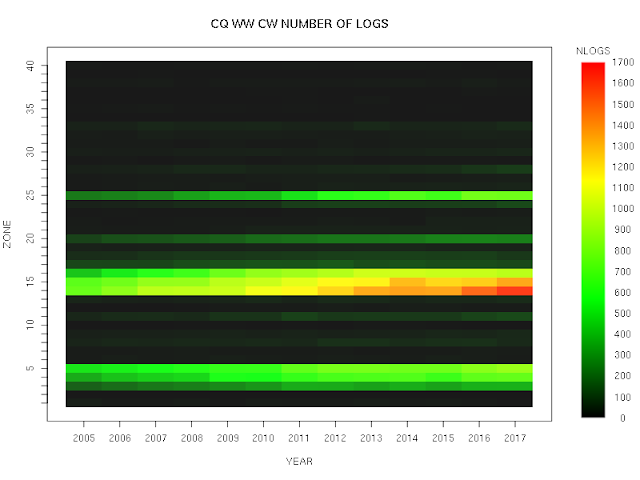 A huge number of analyses can be performed with the various public CQ WW logs (cq-ww-2005--2017-augmented.xz; see here for details of the augmented format) for the period from 2005 to 2017. There follow a few analyses that have interested me. 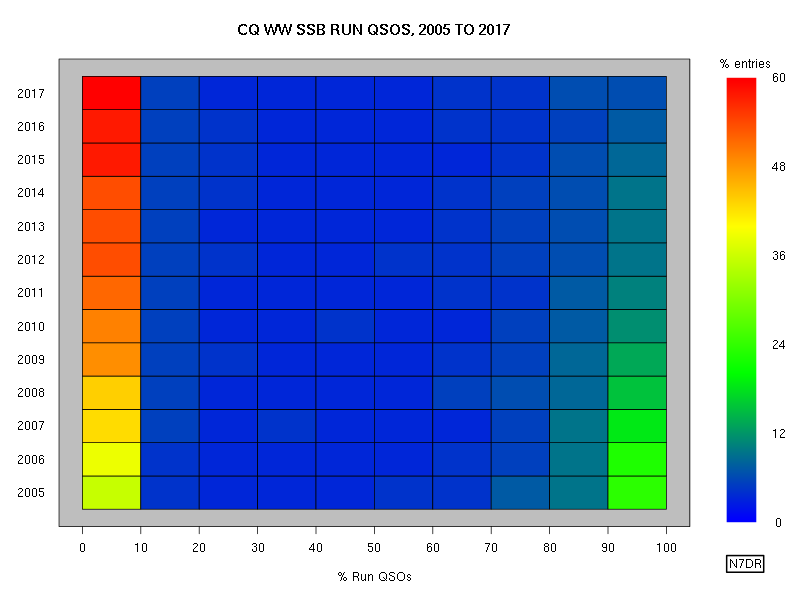 There is plenty of scope to use the files for further analyses. 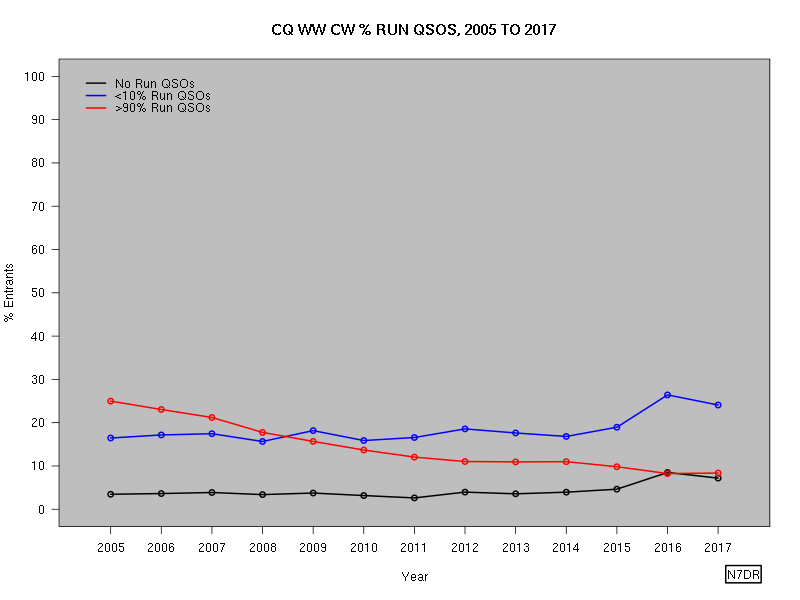 One not infrequently reads statements to the effect that the popularity of contests such as CQ WW has been increasing for the past several years. Certainly it is true that, for CW, the number of logs is still increasing, but the above plot shows that the same cannot be truthfully said for SSB, for which the number of logs has shown no systematic variation for the last lustrum or so. By definition, popularity requires some measure of people (or, in our case, the simple proxy of callsigns) -- there is no reason to believe, a priori, that the number of received logs as shown above is related in any particular way to the popularity of a contest. 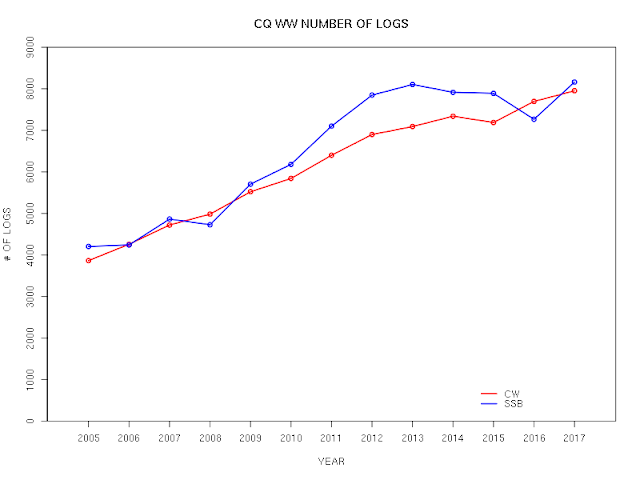 So we look at the number of calls in the logs as a function of time, rather than positing any kind of well-defined positively correlated relationship between log submission and popularity (actually, the posts I have seen don't even bother to posit such a relationship: they are silent on the matter, thereby simply seeming to presume that the reader will assume one). 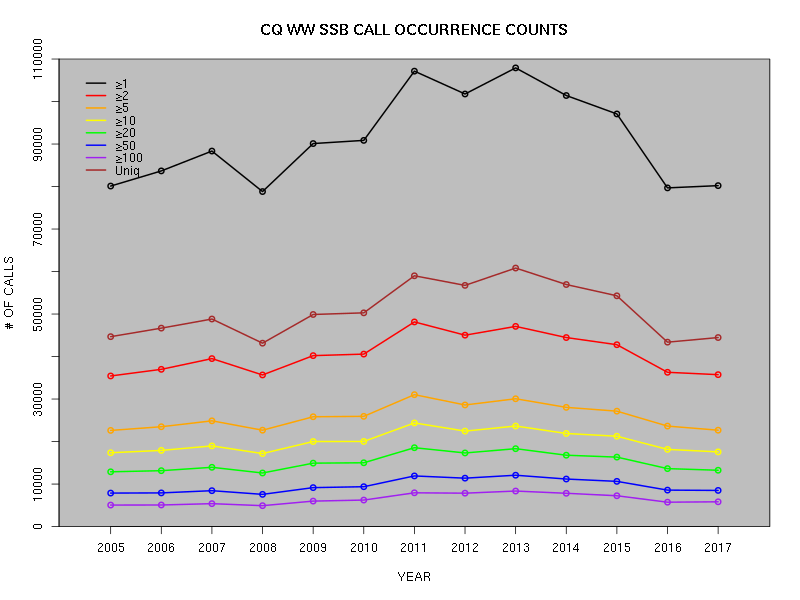 However, the situation isn't as simple as it might be, because of the presence of busted calls in logs. If a call appears in the logs just once (or some small number of times), it is more likely to be a bust rather an actual participant. Where to set a cut-off a priori in order to discriminate between busts and actual calls is unclear; but we can plot the results of choosing several such values. 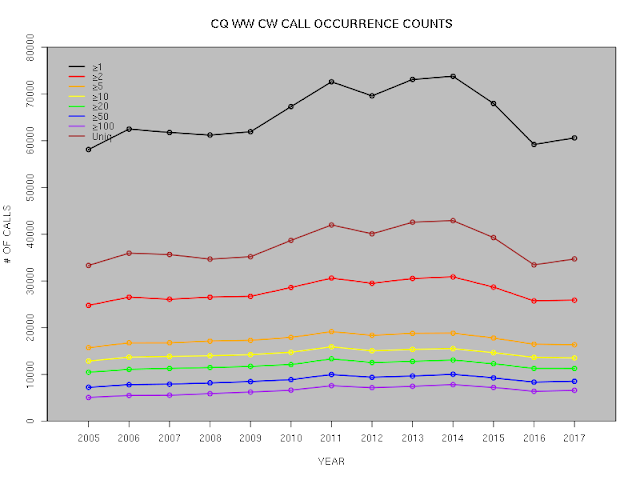 Regardless of how many logs a call has to appear in before we regard it as a legitimate callsign, the popularity of CQ WW SSB in the past couple of years has fallen to a level rarely (if ever) seen in the public logs. Conditions were quite bad for the 2016 running of the contest; nevertheless, while poor conditions might reasonably be expected to have a major bearing on metrics related to the number of QSOs, it is not obvious, a priori, that it should have a substantial effect on the raw popularity as estimated by this metric. 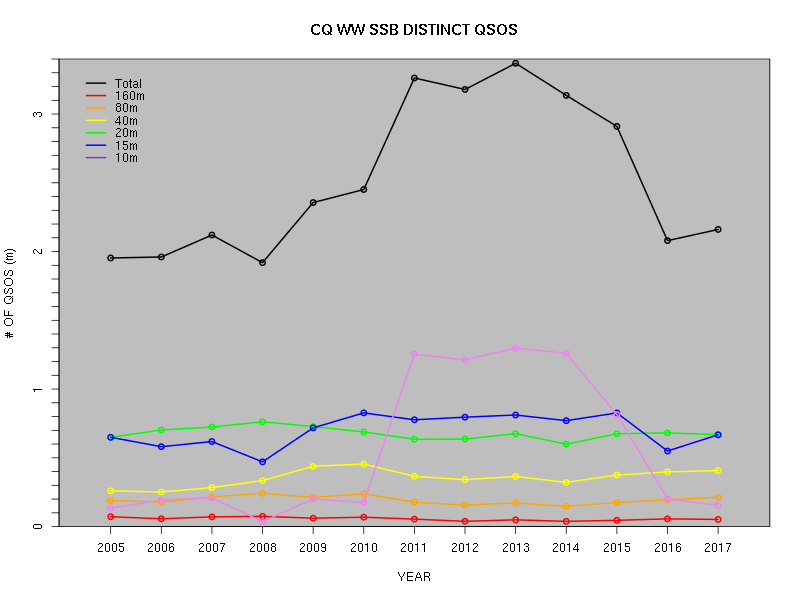 It seems that there were simply fewer stations QRV for the contest in 2016 than in earlier years. 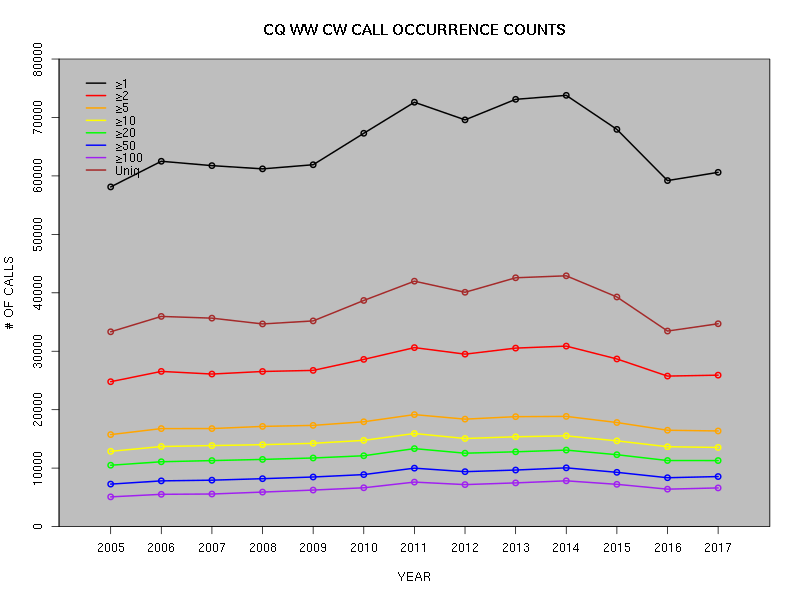 This seems to be borne out by the numbers for 2017, when conditions were considerably improved over 2016, and yet the number of distinct callsigns seems to be more or less the same as in the prior year. 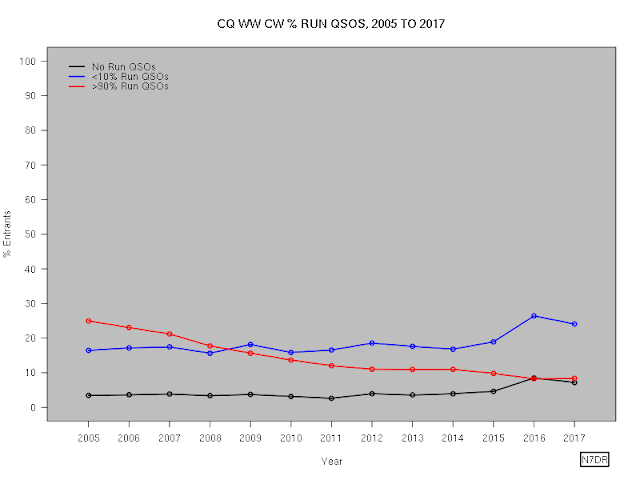 It is certainly difficult to argue, on the basis of the above plot, that this contest is now more popular than it was at a similar point in the last solar cycle -- indeed, it appears, on its face, that the opposite is true. 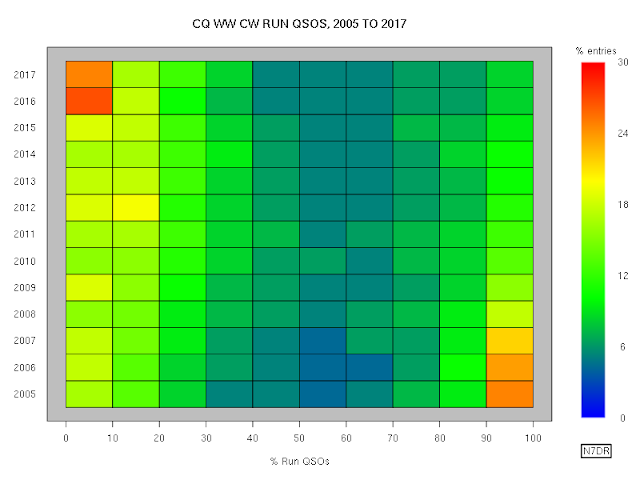 we see a similar story to SSB, except that any decrease in participation since the same point in the last cycle appears to be very small: participation in the CW event in the current inter-cycle doldrums seems to be more or less the same as at the corresponding point in the last cycle. How has the geographical distribution of entries changed over time? 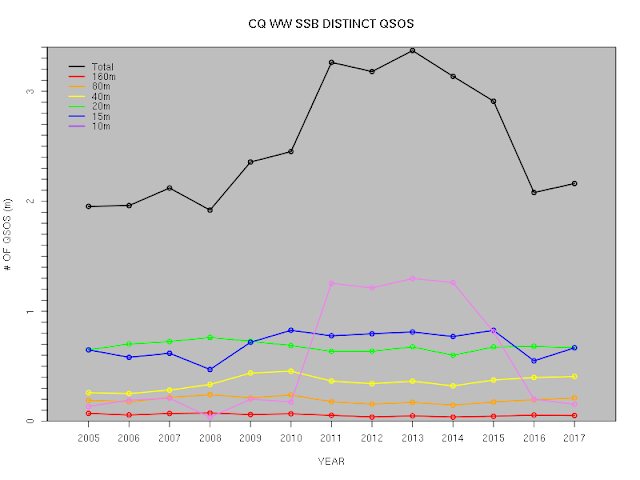 Total activity in a contest depends both on the number of people who participate and on how many QSOs each of those people makes. We can use the public logs to count the total number of distinct QSOs in the logs (that is, each QSO is counted only once, even if both participants have submitted a log). The total number of distinct QSOs in the current inter-cycle doldrums is essentially the same as at the same point in the last solar cycle. I have not investigated the cause of the continued decrease in the percentage of stations strongly favouring running, although the public logs could readily be used to distinguish possibilities that spring to mind, such as more SO2R operation, more multi-operator stations, and/or a reluctance of stations to forego the perceived advantages of spots from cluster networks.